Use your strawberries as soon as possible, because they stop ripening as soon as they’re picked. Don’t wash your strawberries until you’re ready to use them, as moisture causes them to spoil more quickly. Leave the caps on, and store your strawberries in an uncovered container in the fridge. Take them out of the fridge about an hour before you’re ready to use them, as they are best at room temp. Gently rinse your berries and then pat them dry with a towel, and finally, remove the caps with a paring knife, or just a slight twist of the wrist, and they will be ready to eat, or for use in a strawberry recipe. Storage- Remove radish leaves if they are still attached. Store the unwashed greens in a loosely wrapped plastic bag in the vegetable bin of your refrigerator. Because of their high water content radishes deteriorate quickly. Store them dry and unwashed in a plastic bag in the refrigerator. Most radishes should keep for a week. 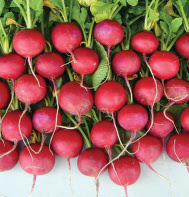 Cook tips-Radishes are known for their spicy taste, which surprisingly is kept mostly within their skin. Peel before cooking if you want a milder flavor. Try small, young radish leaves in salads, they are perfectly edible and have an earthy taste similar to watercress. Sliced or grated, raw radish can be added to salads and slaws. In Europe it is common to eat raw room temperature sliced radishes with butter on bread. Storage- Keep dry, unwashed greens in a sealed plastic bag in the refrigerator. 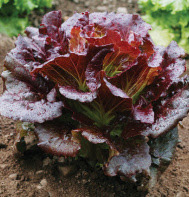 Thicker greens will keep up to two weeks, but tender ones should be eaten within a week. Handling- Just prior to use, swish leaves in a large basin of lukewarm water. After any grit has settled to the bottom, lift the leaves out carefully. Additional rounds of washing may be necessary. If the sink has dirt in it or if you sample a leaf and it tastes gritty, the greens probably need to be rinsed again. How you prepare greens for cooking can make or break a dish. 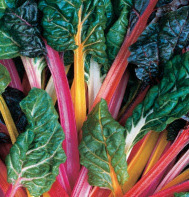 Chard has a thick stem that cooks more slowly than the leaves. If stems are not removed, you wind up with either soggy greens or raw stems. Fold each leaf in half and slice out the stem. De-stem several leaves, then stack them up and slice them diagonally into 1 inch-wide ribbons. If you want to use the stems in your dish, slice them a quarter inch thick and begin cooking them before you add the greens. 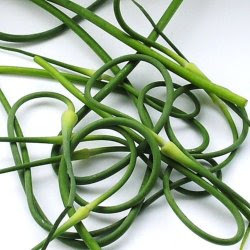 Storage-Garlic scapes keep well in cold storage, although fresh ones taste the best. Scapes can be kept in the refrigerator for a month or longer, in a paper bag. Scapes can also be frozen but they tend to lose some of their garlicky heat. Handling-Before using scapes rinse under cold water. Trim the un-popped flower bulb off before eating and enjoy the rest of the vegetable. What are garlic scapes? Garlic scapes emerge from hard-necked varieties of garlic, usually around June. The stalks wind up as they grow and form fantastic curlicues. Snipping off the scape before the flowerhead matures, allows the plant to direct more energy into developing the garlic bulb. When the scapes are still in full curl they are tender and succulent. Their flavor is milder than garlic cloves, with the tender snap of just picked asparagus. You can even prepare garlic scapes in pretty much any way you’d use asparagus. Grill ‘em, stir fry em, chop em, add em to a salad, these suckers are versatile and wonderful. One of the best garlic scape uses is as a pesto base. Check the recipe section for our version. Storage- First, cut off and throw away the leaves. Never eat rhubarb leaves, they are toxic. Place stalks in a plastic bag to retain moisture and place in the fridge’s crisper drawer, where it will keep for usually about a week. Rhubarb can also be frozen… to do this cut stalks in to 1 inch chunks and place in an airtight plastic bag. Rhubarb will keep for up to a year in the freezer. Storage-Fresh herbs can last up to a week and a half when stored correctly. Rinse fresh herbs well and lay on a paper towel, wrap loosely in a paper towel and place in a zip lock bag. Store in your refrigerator’s crisper. If you won’t be using them within a week or so, it’s best to freeze. Frozen herbs, once thawed, can be used just like fresh herbs in any recipe. Store frozen by removing leaves from stems and place in a single layer in a ziplock bag, lay flat in your freezer and use within a year. Serve as a side to a light meat such as pork, lamb or chicken, or on top of a hearty salad. Heat oil and butter in a large sauté pan over medium heat. Let butter melt and then cook a bit longer, until it’s a deep golden and beginning to take on a nutty smell, about 2 minutes total. Add radishes to pan and toss to coat. Sprinkle with salt and pepper. 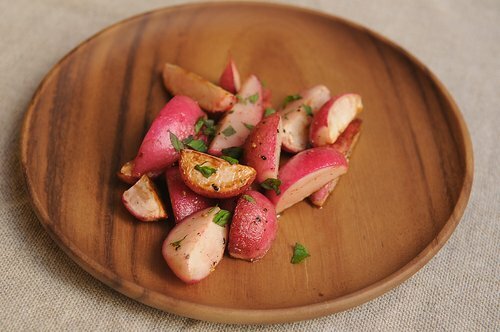 Cook for 8-10 minutes, tossing frequently, until radishes are tender and tinged with caramelization in places. Let cool slightly and sprinkle with mint and additional salt to taste. In a 5-quart saucepan, melt 1/2 tablespoon butter over medium heat. Add fresh breadcrumbs and a pinch each of coarse salt and ground pepper. Cook, tossing, until golden brown, 2 to 3 minutes. Set aside; wipe pan with a paper towel. Swiss chard; slice crosswise 3/4 inch thick, keeping stems separate from greens. In pan, melt 2 tablespoons butter over medium-high. Cook stems, stirring, until tender, 4 to 6 minutes. Add greens; cover and cook over medium-low until wilted, 5 minutes. Uncover; cook, stirring, over medium-high until pan is dry, 6 to 8 minutes. Season with salt and pepper; add a pinch of sugar, if desired. Top with breadcrumbs. Be careful—Garlic Scape Pesto has been rumored to be highly addictive! Process scapes and slivered almods in bowl of food processor. Blend for 30 seconds, or until fairly smooth texture is achieved. Scrape down sides of bowl with your rubber spatula. With machine running, slowly add olive oil, and process until thoroughly incorporated, about 15 seconds. Then add Parmesan cheese, salt, pepper and blend for another 5 seconds. Taste carefully—you might want to add more salt and pepper or more cheese. This pesto is good freshly made, but even better when refrigerated for several hours or overnight. 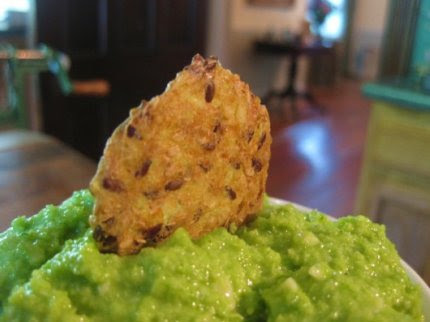 Place pesto in a glass bowl and cover tightly with plastic wrap. Enjoy on pasta, crackers, toast, salad, fish, chicken…the options are endless! 1. Make the rice pudding: Pour the milk and rice into a medium saucepan, add the cinnamon stick, bring to a boil, and then simmer over very low heat, stirring frequently, for around 30 minutes. At this point, stir in the agave or honey and orange-flower water and cook another 5 to 10 minutes, adding more milk if the pudding starts looking dry. 3. Assemble and serve the pudding: Plate the rice pudding and swirl the rhubarb through. Strawberries and balsamic vinegar are meant to be together, enjoy them as a savory appetizer or as described here, a dessert highlight! Heat vinegar into a small saucepan and simmer over medium-low heat until thick, syrupy and reduced to about 1/3 cup, around 15 minutes. Watch very carefully to make sure vinegar doesn’t burn Set aside to cool. Toss strawberries with orange juice and set aside. When vinegar has cooled to room temperature, scoop ice cream into dishes, top with strawberries and drizzle with balsamic vinegar reduction. Grab your spoon and enjoy! This recipe calls for muddling, if your home bar doesn’t include a muddler no worries, the handle of a wooden spoon or spatula will work in a pinch! Garnish with mint leaf and half a strawberry. That’s it for this week folks! Feel free to post your amendments to the recipes or other fantastic ways you used our fruits and veggies, as sharing ideas is one of the awesome benefits of being a part of this CSA community!